Mateus (Wild, 1978) height 30", bloom 5.5", season EM, Dormant, Diploid, Rose wine with lighter midribs and gold throat. Midnight Angel(Brooker, 2003) height 24", bloom 6", season EM, Semi-Evergreen, Tetraploid, 15 buds, 3 branches, Deep dark purple with lighter halo above deep green throat. (Salem Witch × Midnight Raider). Monadnock Baby Dreams (Timm, 2007) height 22", bloom 3", season M, Rebloom, Dormant, Diploid, 15 buds, 2 branches, Ruffled light pink with slightly darker halo above green throat. (Lullaby Baby × Jolyene Nichole). Mainely for Pleasure (Valente, 1995) height 28", bloom 6.5", season ML, Dormant, Tetraploid, Clear lavender pink with pale bluish eyezone and green yellow throat. (Smooth Flight × Matt). Marginal Way (Valente, 1992) height 28", bloom 6", season M, Dormant, Tetraploid, Lavender with darker lavender eyezone above green yellow throat. (In the Purple × Mandrakos). Merriness (Sikes, 1996) height 19", bloom 5", season M, Rebloom, Dormant, Diploid, Pink rose blend and yellow to green throat. (Second Thoughts × Neal Berrey). Mokan Moon (Lenington-G., 1976) height 28", bloom 7", season M, Semi-Evergreen, Tetraploid, Gold self. Moorea. (Millikan-B., 1985)height 25", bloom 5", season EM, Tetraploid, Deep coral pink with large deep rose eyezone and chartreuse throat. Mont Blanc(Lambert, 1966) height 36", bloom 7", season M, Dormant, Diploid, Fragrant, Very pale yellow self with green throat. 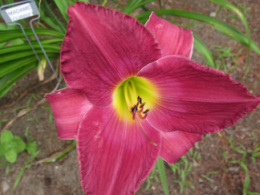 Mary Kirk (Peck, 1970) height 29", bloom 6.5", season EM, Evergreen, Tetraploid, Shell pink self with chartreuse throat. (sdlg × Queen Eleanor). Monster (Pettus, 1975)height 32", bloom 9", season M, Dormant, Tetraploid, Yellow blend with faint brushing and green throat. (Tet. Cashmere × sdlg). Mount Zion (Stevens-Seawright, 1986) height 45", bloom 7", season M, Dormant, Tetraploid, Orange gold self with orange throat. .
My Sweet Rose (Kroll, 1992) height 26", bloom 5.5", season M, Semi-Evergreen, Diploid, Very Fragrant, Rose pink self with cream to deep green throat. (Dark Hours × Siloam Virginia Henson)..